Costuming Drama: Corset is finished! Now Decisions! 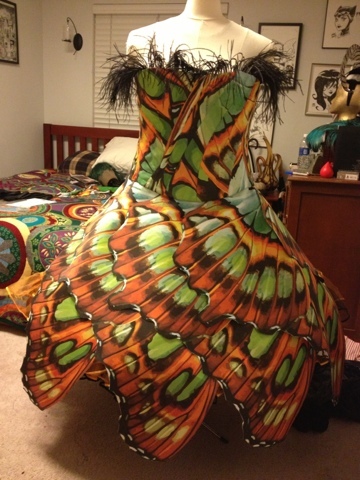 The corset is bound and feathers are at the top of it. Now, I have to decide, by tomorrow (Tuesday) which way I want the wings. One has the bottom frilly parts of the wings on top. I like this because I spent a LOT of time cutting these out and it seems like a shame to cover them up. 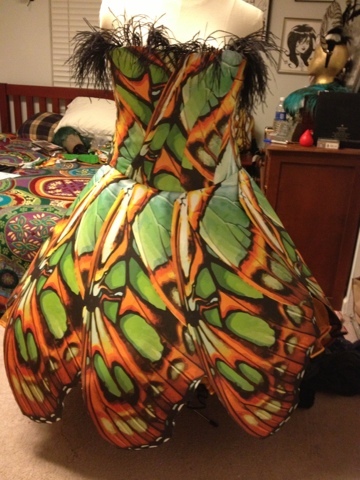 However, this direction is somewhat bust and the colors are the lighter colors of the bottom of the wings, so the green doesn't really match the corset very well (that was made entirely with Wing tops. It does look pretty awesome though. And here they are with the tops facing up. the wings are hung exactly the same way as the other one, they just have the smooth top showing and since they are pretty much a triangle, this part of the wing faces almost straight down. The color matches the corset better here and this look is much smoother, which I like. I can't decide!If you have an opinion on which one you like better and read this before Tuesday night, please leave me a comment or send me some sort of ping with which one you prefer! Thanks! OMG I can't believe how amazing this is!! They are both beautiful, though I slightly prefer the second one (with the straight top edge.